2015 : WoodWings is born. We start as a Belgian travel organisation with the offering of an all-in training camp for Belgian and Dutch longboarders. We can proudly say that we are unique with this formula in Europe. Our concept is based upon our years long experience in the world of longboarding combined with the knowledge we gathered for years in the travel industry. Since we have already been on a board for more than half of our lives, we can 100% say that this concept really is « by boarders for boarders ». 2016 : Due to the high demand for international registrations, coming from all over the world, we decided to open our camps for international riders. It was an immense success, with riders coming from Australia, South-Korea, America, Ireland, France, Switzerland, England, Austria, Germany, etc. 2017 : Next to the WoodWings 'all-round longboard camp' we're working on the extension of a professional 'downhill training facility'. In order to give our attendees a stronger downhill experience, we will be offering longboards, freeboards, buttboards and drift trikes. This way we want to create a stronger image for - and a more professional look on - downhill road sports in general. 2018 : 17 nationalities and counting! Read more. Longboarding, a sport which was once practiced mainly by adults, has become since several years hugely popular amongst young people. This is of course great for the sport, but every advantage has its drawbacks. In Belgium there is hardly any infrastructure that meets the requirements of most longboarders. Therefore, there is often irresponsible longboarding on public roads without proper protection, without adequate safeguards and above all lack of experience and knowledge. Since longboarding is a real hype, we currently get confronted with an enormous selection of material and en endless search for ‘the best setup’. To respond to these needs, we came up with the idea to create a platform where our attendees on the one hand can get experience in a safe way, and on the other hand have the possibility to test a large selection of gear. 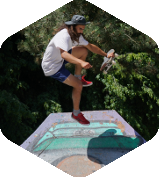 With the WoodWings project we want to share our knowledge and our passion for longboarding and the freedom we experience within it. We want to create a community where our attendees have the freedom and opportunity to enjoy the sport in a safe and unique environment where they can continue to develop their passion and experience. Therefore we will work hard to provide you with the best training, holiday, leisure and camp facilities you can imagine!